Atom Egoyan must have either been really inspired or really upset with how director Denis Villeneuve's Prisoners turned out last year as he has, in that year, produced a familiar feeling film that not only steeps certain motivations of its counterpart in its DNA, but takes elements of that film altogether and reconstructs them in a way that almost says this is what Egoyan would have done had he been given Aaron Guzikowski's screenplay. Of course, Egoyan could have been working on this script with David Fraser long before Prisoners arrived in theaters and thus made him all the more unenthusiastic given the social status of his film would always be on a certain back-burner given the timing of its culmination. Ryan Reynolds gets the Hugh Jackman role (hold your comments) though his character doesn't have as much of a narrative drive and Rosario Dawson takes the Jake Gyllenhaal job without the nervous ticks or personal issues that re-enforce the investment in the job. Instead, these are all more middle of the road character executions set in the middle of extreme circumstances that are dealt with way too cooly. This and the fact Villeneuve's film is expertly shot and beautifully eery outweigh what The Captive strives to be, yet there is still a certain amount of unavoidable emotional involvement when it comes to content such as this. Beyond the obvious mystery elements (which are conveyed more through narrative order than withholding information here) The Captive is very much a film about repercussions and realizations than it is abduction or child abuse in this digital day and age. The film, right out of the gate, with its creepy antagonist in a thinned-out Kevin Durand would have you believe this is going to be all about the hunt for this monster and the intelligence with which he outsmarts his adversaries, but the overall impression the film gives is not one of a battle between good and evil, but the battles going on within ones self and the fight to either push certain qualities out or attempting to find ways to go on while constantly dealing with these emotions. As the film opens it reveals a well-groomed, well-postured man by the name of Mika (Durand) standing in a house that is as polished as he is looking through the window at the white snow. We are given no indication as to where we are, who this man is or why he has a secret door in his elegant structure that houses a teenage girl playing piano and watching a surveillance camera on the computer monitor next to her. Jumping to a similarly snowy atmosphere a clearly distraught Tina (Mireille Enos) marches into a small diner to sit across from Nicole (Dawson) as they discuss a girl named Cassandra and how much Tina misses her as well as Matthew whom, again, we have no idea or context with which to place these names. Cutting to a man at an ice skating rink, Matt (Reynolds) looks on as a teenage boy skates in front of him. Matt tips his hat when the young man notices him standing there and promptly leaves. In his truck, the snow coming down consistently, Matt picks up a young girl hitch-hiking down the road. Matt seems to be looking for something more until he finally sees the young girls face clearly and learns her name. We don't know his intentions, but we are slightly suspicious already. There is a moment of awkward back and forth between Tina and Matt that clearly takes place before the time when Tina met Nicole. Mika seems to afford his comfortable lifestyle by working with Vince (Brice Greenwood) at a large land development company as we then jump to their facility where Jeff (Scott Speedman), a detective, begins questioning Vince about what seem to be the whereabouts of Nicole as her face is plastered all over posters behind the two as they reach Vince's office. Once more we go back to the conversation between Tina and Nicole in the small diner before we are flashed back to eight years prior when Nicole first hires Jeff to work on her team and Matt and Tina are happily married parents of a young girl who is abducted when her and her father stop at a pie shop on her way home from ice skating practice. Matthew (Ryan Reynolds) has an emotional moment in The Captive. This all occurs within the first twenty or so minutes of the film and so it becomes fairly obvious between this and the next ten minutes where things are heading and how things might add up, but I won't mention any more details about the plot. Instead, what is the most obvious thing to discuss here is the manner in which Egoyan has chosen to convey his story. From the beginning the narrative not only jumps around from character scenario to different character scenario but shifts in time between these different character situations from scene to scene. It's not as if we are in the middle of a scene with Nicole and Jeff that cuts to Matt to show what he is doing at the same time to then only cut back to the narrative string of Nicole and Jeff, but instead we become accustomed to the fact it will cut back to Jeff and Nicole in a scene that could have taken place years or months in the future or past. It can become frustrating to the point it works less as an effective tool and more as something to try and make the story seem less conventional than it is. In the moment of each scene it is up to the viewer to decide where we are in the scheme of things and how this fits in with the overall story being told. It is meant to enhance the mystery, to give the audience the feeling of piecing a puzzle together with these scenes as if to say there is a way to edit the film that would make a lot more sense, but you have to figure out that order. What makes this playful sense all the more irritating is the fact that there is actually interesting character work going on here. We all know police interrogation scenes exist solely to put viewers on edge, but Reynolds displays some raw emotion in the one that takes place here that has been absent from his filmography since Buried in 2010. The remainder of the cast is fine for what they're asked to do, but besides Reynolds they could have been played by anyone within the caliber range of what Egoyan has collected here. 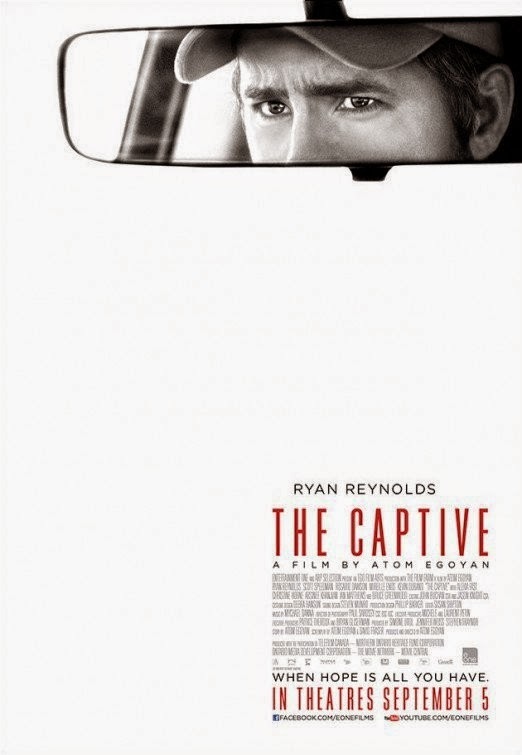 This brings us to a point where we also realize The Captive is a rather standard film, something that would sit nicely on the playlist of movies on a rainy Sunday, but leaves no impression on us beyond that of what it could have been were the movie actually willing to go as far and get as weird as it suggests it wants to. The film hints at some seriously disturbing, very strange stuff going on that deals with child abduction and molestation rings, but instead of getting into the details of these antagonists and why they truly deserve justice from the authorities we are delivered the struggles of Matt and Tina with their guilt and regret that is heightened by the vague games Mika likes to play with them. There is never enough development in any one area of this screenplay. It's simply a couple of scenarios treaded lightly rather than one inspected interestingly. We know there is an end goal here, but the absence of any genuine suspense (due to the backwards fashion of its chronology) forces the film to dig deeper into the psyche of its quartet of main characters which unfortunately only provides a few, small moments of real emotional involvement rather than putting us on the edge of our seats with lumps in our throats as Villeneuve did not long enough ago for us to forget how much better this could have been done.